I’m going to start answering lab questions bit by bit – I’ll try to be as clear as possible and as detailed as necessary without putting anyone to sleep! Does blood go bad if it’s kept in the fridge too long? Short answer, for those too hurried to read on: Yes. Yes it does. Now, let me get a little deeper into this, for those who may care. Your blood is made up of different components – red cells, white cells, and platelets – floating around in a liquid called plasma. The components all have different functions in your body. Red cells transport oxygen to your tissues, which is why folks who are severely anemic will be exhausted and weak, and be short of breath as they try to get enough oxygen to keep going. Platelets stop bleeding by making a plug at the site of an injury to a blood vessel and sealing it up, while plasma contains soluble (dissolved) factors that also participate in the clotting process, along with a host of other proteins, including antibodies. These are the main three components we use in the blood bank: Red cells, platelets, and plasma. Red cells are down at the bottom, plasma on the top, and the fuzzy white layer in between them is a mix of white cells and platelets. The percentage of blood that’s made up of red cells is called your hematocrit – a normal number for that is around 35-45%. This patient’s hematocrit is about 21, which is very low, and probably what’s bringing them to the emergency room. 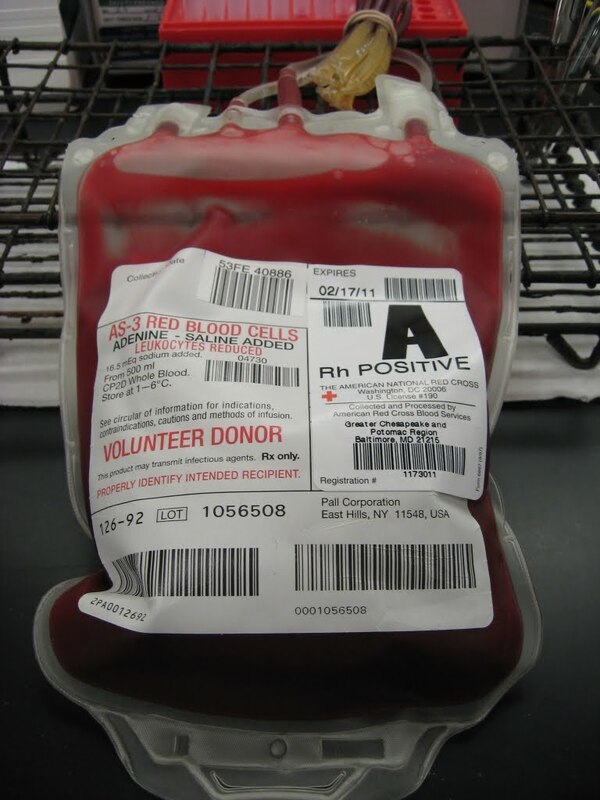 Way back in the old days of blood transfusions, they would take a unit of blood from a donor, and then give it to a recipient, whole. You’d get the package deal, all the components for the price of one. Notice how the top is clear fluid – that’s the plasma. You can see it because the unit has been sitting for along time and the cells have settled. As we got smarter about the details, we figured out that the different components could be separated out and given separately, to treat patients more effectively. Giving entire units of whole blood to a patient can easily throw the body in to circulatory overload, which means the heart can’t pump properly because there’s too much blood volume for it to handle. You’re also giving the patient components they don’t need and can possibly have a bad reaction against. So there was an eventual shift towards transfusing patients with only the component they needed, instead of whole blood. Running out of hemoglobin because you’re not making enough red cells? You’ll just get red cells. If you’re bleeding, you’ll get platelets or plasma (depending on various lab tests and the type of bleeding, one or the other, or both, may be indicated). This way we’re giving much smaller volumes, exposing patients to less foreign material, and treating specific problems with the right products. So when blood is initially processed from a donor, it gets split up – the blood is centrifuged so the heavy red cells sink to the bottom and the plasma floats on top, with a layer of white cells and platelets in the middle. 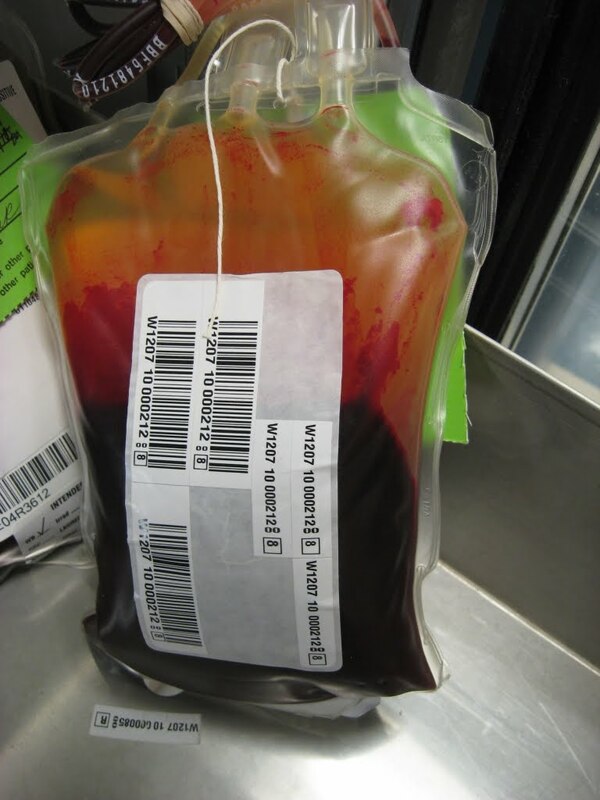 The bags that the blood is collected in are coated with anticoagulant to keep the blood from clotting, and additives to keep the red cells alive longer. Depending on the mixture of additives and anticoagulants, a unit of red cells will have a different lifespan, between 35 and 45 days. Why do they eventually expire? Well, red cells are alive. 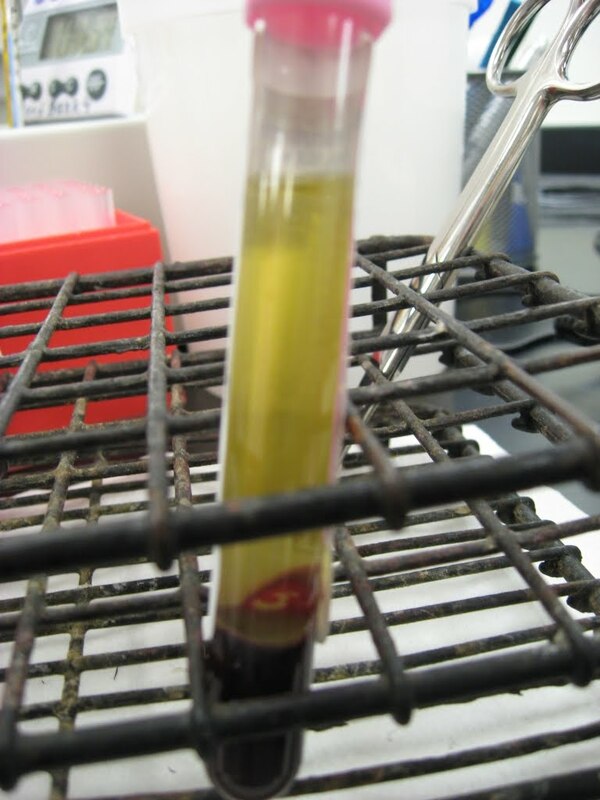 After a certain point, the cells will die and no longer be of any use transporting oxygen – not to mention the fact that when they die they release some nasty stuff like free hemoglobin and potassium, which aren’t very good for you when they’re not bundled up and safe inside a red cell membrane. We keep them cold (1-6C) to keep their metabolism slow and also to prevent any bacterial growth – while every effort is made to clean the site before inserting a needle for a blood donation, bacteria are sneaky little things and may get in, and keeping everything cold will retard their growth if they’re in there. This is a unit of what we call “packed red blood cells” – the plasma has been taken off and it’s been filtered to remove white cells, which can cause transfusion reactions. So, blood is good for a little over a month in the fridge after it’s taken from a donor, because studies have shown that not enough red cells stay alive past that point to make the unit a useful therapy, and the stuff leaking out of the cells gets to be in too high a concentration to be safe. The pros call that the “storage lesion”. When transfusions are needed for babies, we always make sure to have very fresh blood (under 10 days old) because of those products that dying cells leak out. An adult can handle a small increase in potassium, but an infant’s system could easily be overwhelmed, so we reserve very fresh blood for infant transfusions. Another option is to wash the unit to remove the bad stuff, but that gets expensive and increases the chance of contamination since you need to open the bag. When we do need to open the unit for any reason, we need to change the expiration date to 24hours, because of the possibility of contamination. Tune in soon for an expiration date lesson on plasma and platelets! This entry was posted in Uncategorized on January 25, 2011 by antijen. YOu really enjoyed this eh?